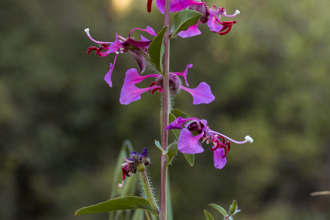 Our Santa Monica Mountains host a number of different Clarkias, a species often characterized by pinkish-purple, 4-petaled flowers blooming in spring. Speckled Clarkia flowers are about 2-3 inches in diameter. 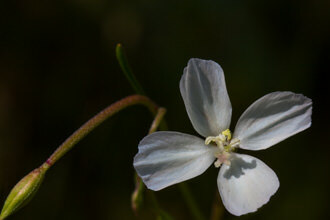 They have a reddish purple center, changing to white and then a lighter-reddish purple at the petals' ends. The 4 sepals have an interesting curvature to them. 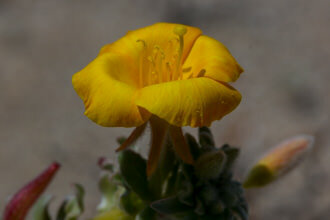 The speckles on Speckled Clarkia are not always prominent, as the photos posted here show. This may lead one to wonder if the plant they are looking at is another related variety of Clarkia. 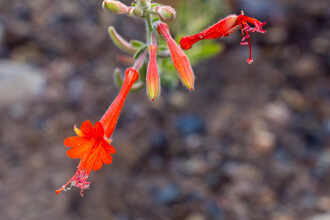 The thin leaves of the Speckled Clarkia are sparse and unremarkable. The flowers generally appear one per stem - this can be a distinguishing feature from other types of Clarkia like Farewell-to-Spring. The species name Clarkia comes from William Clark of the expeditioners Lewis and Clark. 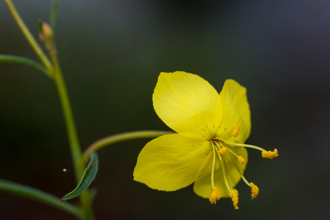 The family of plants that the Clarkias belong to is also called Evening Primrose, as some other varieties are known for opening only at night. Last modified: July 06 2017 09:15:44.